How could using social media possibly save your career. You’ve gotten this far in your career without having to ‘tweet,’ ‘post’ or ‘like’. Why bother? It’s just a fad and things will soon change again. Won’t they? I mean, what’s the worst that could happen? Unfortunately, I know many senior leaders and ‘rising stars’ that think like this. Richard Nixon failed to recognize the power that the new medium of television could have and it played a significant factor in losing his first bid for the White House. Could you be making the same mistake? In the early 1990s thousands of high performing and ‘high potential’ business, scientific and engineering leaders found their careers curtailed — virtually overnight. Could this happen to you? If you’re curious, read on. In 1960 the primary content channels of the time were mainly newspapers, radio and the fairly recent arrival, television. Mainly broadcast media but effective at mass distribution of content and shaping public opinion. 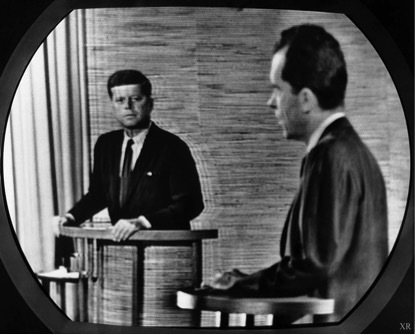 1960 was also the year of the first televised debate in a US Presidential election. Those listening to the radio broadcast of this debate tended to favor Nixon while those watching on television strongly favored Kennedy. Part of the reason for Kennedy’s success on television was that Nixon’s campaign team ignored the potential impact of the visual aspect of television (e.g., refusing make-up, not looking directly at the camera, etc.). The impact of this new medium had a strong effect on voters and no election since has underestimated its power. Just like television did in the Kennedy-Nixon election, today’s social media of Facebook and Twitter has also influenced US Presidential elections over the past decade. It also played a significant role in #brexit. However, I know of far too many executives who are either avoiding social media altogether or using it only for personal purposes. What can mastering social media do for you as a leader? Social media gives you a personal and transparent way to communicate directly with your employees, suppliers, investors and customers. You can share your thoughts and ideas, which can then spark conversations on issues relevant to each of these stakeholder groups. Social media is a way not only to join the conversation but, through your commentary and guidance, to also guide and shape your industry or business community. There is a lot of talk these days about being an ‘authentic’ leader…. social media is a powerful medium for authentically demonstrating your uniqueness as a leader. Mastering social media can also help you communicate more effectively with your stakeholders across geographical distances and time zones. Instead of broadcasting your ideas to your teams and partners around the country or the world you are able interact with them. You can connect and converse directly with employees and customers regardless of country or time zone. Do you offer flexible working hours to your employees? Social media can allow everyone to stay part of the conversation no matter which of the 24 hours they choose to work. What about engagement? The downsizing, off-shoring and efficiency programs of the 1990s and early part of this century have left us with flatter, globally dispersed organizations. Frequently teams and their leaders disconnect from each other physically and emotionally as well. We are more efficient but often feel like we dont connect. The human side of business that people crave has been disengaged from many people’s working lives. Today’s social media tools can help you create stronger engagement with your teams and organization. Finally, mastering social media may save your career. In 1991 I moved to Budapest to work at the first ‘Western-style’ executive development centre in the former Eastern Europe and Soviet Union – The International Management Centre. This business school was funded by ‘Western’ government aid and philanthropists to educate and develop market oriented business leaders. It was later to become the business school of the Central European University. The local Hungarian faculty I worked with used to speak of the ‘lost generation.’ These were highly skilled and competent leaders who were not only recognized experts in their area but also were bilingual in their native Hungarian and Russian. Russian was the second language they learned in school and, given the politics of the time. The most gifted linguists were able to use this effectively for career growth pre-1991. Almost overnight English-language fluency became a critical executive leadership skill. Social media, just like television in the mid-20th Century, has forever changed how we communicate, receive and share information. I believe that mastering social media is a necessary executive skill for the 21st Century.